ALPHASMART NEO 2 PORTABLE WORD PROCESSOR WITH NYLON BAG. medaras20015 has no other items for sale. Details about ALPHASMART NEO PORTABLE WORD PROCESSOR WITH USB CABLE/3(AAA)BATTERY INCLUDED. 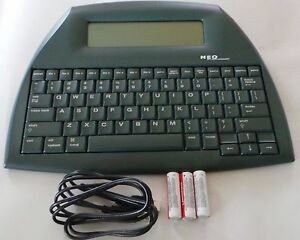 ALPHASMART NEO PORTABLE WORD PROCESSOR WITH USB CABLE/3(AAA)BATTERY INCLUDED. Fast shipper. Product as described. A pleasure. This is exactly what I was looking for! Fast shipping, well packed. Yay! Arrived very quickly. Looks almost new. Item just as described and packaged well. Thanks! It is awesome! I love it! Thank you! Prompt shipment and arrival. Product in great condition. Fantastic seller. received item quickly. Good purchase. Defective; seller offered to replace but then went silent. Process has stalled. My says made in China, but I like it. Delivered quick and like new. I use the Alphasmart to take notes in class and I love it. You don't have to worry about battery or space. After class, I go home and transfer all my notes onto my desktop. It's built astonishing well for the price, and the ability to change the keyboard layout to Dvorak is fantastic. Keyboard is super comfortable to type on and is much like an old Dell laptop keyboard in key height. Overall, a great purchase. Highly recommended. No bells, no whistles, all great. A rugged device with incredible battery life and no distractions. The only thing that would make it better is a backlit screen, but you can get a book light to clip onto it if you need to work in the dark. Fits in a 13 inch laptop sleeve with plenty of room for cables, a book or two, etc. It transfers your work to a computer by plugging into a USB port and identifying itself to the computer as a keyboard. It sends all your saved typing as new keypresses, effectively retyping it onto your computer. This gets around any issues with old/proprietary file types that the computer wouldn't be able to open, but it does take a little while and you can't do other things with the computer while it types. The Alphasmart Neo is probably about the greatest writing tool ever devised. Long before typewriters were invented pen and paper was the tried and true method of getting your thoughts recorded. It's simple and effective, but can by very tiring on the writing hand and can also restrict the speed at which thoughts flow out onto the paper. The typewriter, by comparison, was a great improvement but had its own drawbacks like the need for ink, the frequent need to reload paper, and the loud noise that it generated. Portability was also an issue. Eventually typewriters became electric and were miniaturized to the point that they were moderately portable but we're still no terribly convenient. Enter the computer, most notably the laptop. While their multitude of uses to the modern author abound, editing, formatting, even graphic design for illustration and covers... There is the constant niggling worry of battery life. There is also the undeniable fact that having a screen in front of one's face for hours on end is not only taxing on the eyes but also has the effect of leaving the writer feeling isolated from his or her environment. Now there are modern attempts at alleviating the distractions associated with writing on a laptop, and many of them work quite well. Focus writer, a free open-source richest program that works on Mac, PC, and Linux, being my personal favorite. These applications can be extremely effective and in fact I wrote my first five books using Focus writer. The constant worry about battery life and the desire for safe backups (not having to depend on a mechanical hard drive) eventually led me to the Chromebook, a device that I highly recommend for writers. For general writing it's hard to beat. You get instant cloud backups, a solid state hard drive, 7-10 hours of battery life, and a browser you can use to research information pertinent to whatever your writing. I thought with the Chromebook I had finally found the ultimate writing tool but though it was close, and is definitively at the top of my list of writing devices, even it gets beaten out by the Alphasmart Neo for getting a first draft out of my mind and onto the page. The Neo is this; a very nice full sized keyboard with comfortable and responsive keys that saves every key stroke automatically to RAM, it has a battery life of over 700 hours on 3 common AA batteries, was built to be extremely sturdy for classroom environments, and best of all allow the writer to keep his or her head up and feel more of a part of the surrounding environment. The LCD screen is also easily seen in full sunlight so writing outdoors at the park or the beach is back on the table. It's a device that can be tossed around, boots up within two seconds, records your thoughts, and then powers down at the press of a button. Connect it to your PC or tablet via USB, open your favorite word processor, hit the Send key, and everything you've typed gets dictated onto your more advanced computing device. The Neo is a digital typewriter that does only one thing, but does it extremely well. Again, I cannot emphasize how nice the keyboard is to type on and the idea of never having to worry about battery life is undescribably liberating. You sit down and let the story pour out of your mind rather than having the temptation to go back and edit your document as you go. Better still, a quick press of CTRL+W will give you your word count if you're keeping track. At this point if you need one more reason to convince you to just buy one for yourself Google "painted Alphasmart Neo" and see how cool they look painted up like vintage typewriters. So there... No more to this overly verbose review, just buy one!